The Iraqi parliament has approved Prime Minister Nouri Maliki's nominees for the key government posts of defence and interior ministers. The two posts had remained vacant for nearly three weeks due to wrangling between the main parties in the governing Shia alliance. Jawad Bulani, a Shia, is the new interior minister and Abdul Qadir Obeidi, a Sunni, the defence minister. Shirwan Waili has also been approved as minister of national security. The nominees were approved by an overwhelming majority and sworn in by the parliamentary speaker after brief questioning by members of parliament. Filling the posts was seen as vital in furthering the government's efforts to fight the insurgency. 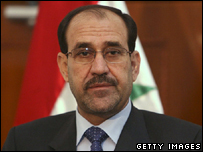 For the first time since the parliamentary elections in December 2005, Iraq now has a complete government. Lt Gen Obeidi, a general in the Iraqi army under Saddam Hussein, told parliament that he had been demoted for opposing the 1990 invasion of Kuwait. He said that he was forced to retire in 1992 and detained two years later. He faced a military court which ordered the confiscation of his house and other assets. Gen Obeidi insisted that he had no links to any Iraqi political faction. Mr Bulani was a member of Iraq's interim Governing Council in 2004. 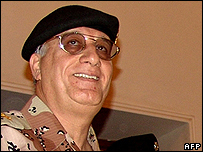 He became a member of the Iraqi parliament in 2005. During the rule of Saddam Hussein he was an air force engineer but left the armed forces in 1999.